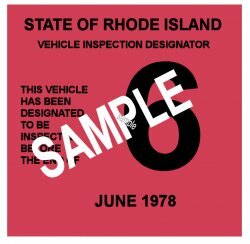 1978 Rhode Island Inspection Sticker - $20.00 : Bob Hoyts Classic Inspection Stickers, Add a Final Touch to your Restoration! This 1978 Rhode Island Inspection sticker was restored and reproduced in better condition than the original. This is the latest sticker for RI that we have available. If you have a good photo or an orignal of another that we do not have listed here, you can sell or give us, we will supply you with a free reproduction of any sticker up to 1983.